A yellow fever vaccination certificate is required for travelers over 1 year of age arriving from countries with risk of yellow fever transmission and for travelers having transited more than 12 hours through the airport of a country with risk of yellow fever transmission. See World Health Organization International travel and health webpage for disease distribution maps listing countries with risk of yellow fever transmission. 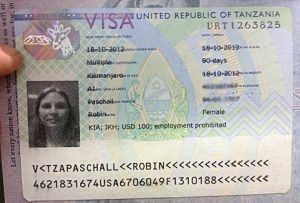 YOUR PASSPORT MUST BE VALID FOR AT LEAST 6 MONTHS AFTER YOUR ARRIVAL DATE IN TANZANIA!! Otherwise, they will not even let you on the airplane! Alternatively, you can get your visa ahead of time. Or call them in Washington D.C. at 202-939-6125, and ask for a visa application. Allow at least 30 days for processing. You might want to consider sending it certified mail or Federal Express both directions to ensure the safety of your passport. If you are going through Kenya, you will need a separate Kenya visa. You can get your Kenya visa at the Nairobi Airport or at the border crossing from Tanzania.